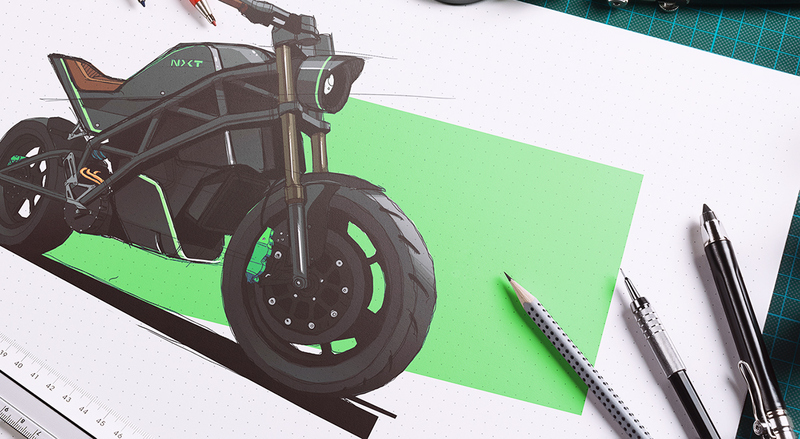 FRANK Industrial Design developed NXT Motor’s corporate branding and first motorcycle concept. 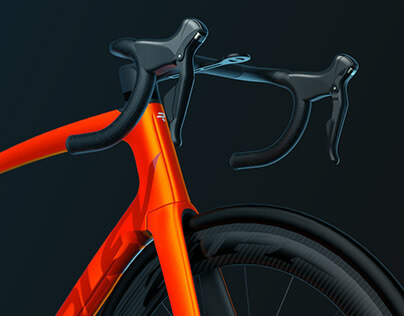 The first bike lined up for production will be positioned within the high power naked/sports segment, featuring a unique design combining high tech and classic surface language, borrowing from the rich biker culture worldwide. Where most electric bike builders tend to just showcase the technical capabilities of an electric drive train, creating a hugely expensive bike as a result, NXT Motors wants to enter the market with an affordable supersports bike. For bikes, the supersports segment is the most popular of all, opening the opportunity for NXT Motors to reach the widest possible audience. To do this, the marque chose a minimalist yet premium design direction for both branding and motorcycle. A combination of retro with high-tech design elements makes for a timeless bike. We held a series of in-depth brainstorm and ideation sessions at House Of Innovation, our Headquarters. For us to find what our NXT Motors clients were looking for, we employed a set of in-house developed brainstorming tools in order to lock out the desired characteristics for the brand. 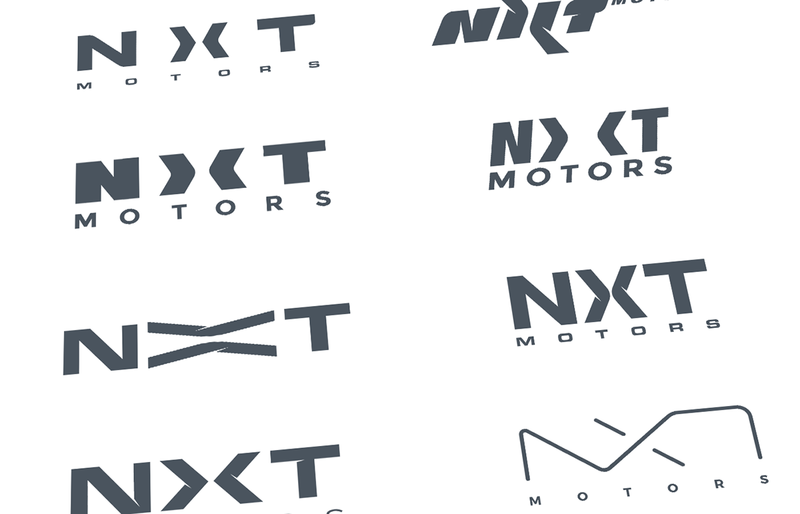 NXT Motors' logo had to breathe cutting edge with a dash of nostalgia. The team decided upon the generation of a logotype logo. As it was still early days, an icon could still be devised in a later stadium of the project. 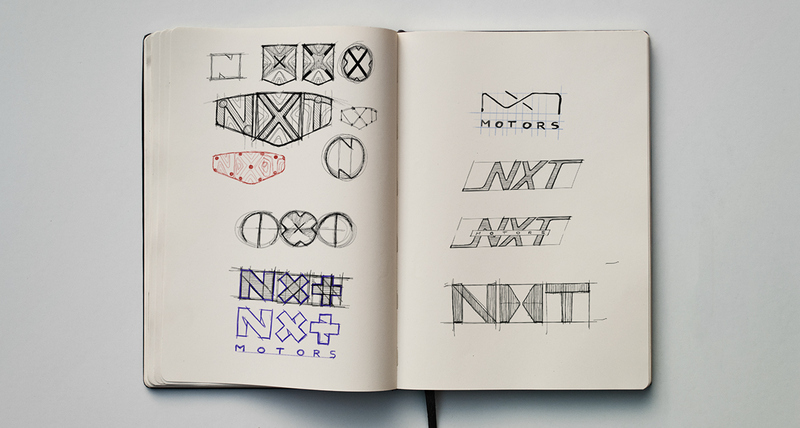 Numerous logotype variations were designed in order to get to the final iteration NXT Motors sports today. A brief glimpse of our work-in-progress. After our creative sessions with the client, the combined output was processed and a large amount of sketches and doodles was generated. Each unique proposal answered to clues we had discovered during brainstorming. The best logo proposals were retained and detailed. A final selection was presented, after which a unanimous vote chose the ultimate winner. The company logo has been the one on the bottom left during the early stages of start-up and crowdfunding. Later, when the motorcycle started to materialise more, we chose to change the logo to the one next to it. We believed it was a better match with the message NXT Motors brings forward, and with the design direction of its bikes. Starting to imagine a new kind of motorcycle, we set off to sketch - a lot. The theme was to combine vintage café racer style bikes with a touch of modernism. From rough sketches we tend to generally evolve to more refined product visuals over a period of time. For this project however, we had to make that switch much faster than usual, as high end visuals were needed for the crowdfunding campaign that was about to launch mid-2016 (yep, the campaign was a success). We knew, however, that we could refine and tune the design of the bike in a later stage of the project. Today, there aren't many electric motorcycles out there. Although they do exist, these rare birds are only known to the expert and are completely invisible in showrooms. The ones that make it onto the mass market are found to be full of concessions and do not weigh out their combustion engined counterparts. Crafting out the core of the new bike was no mild task, and we went through a billion iterations before a final design direction was found. During this kind of lean and mean development process, it is not uncommon that certain components are changed in the midst of a process, or that ideas shifts and new insights come up when you least expect it. The goals of the crowdfunding campaign were met, meaning the NXT Motors project could continue to the next phase: the refining of the design and the build of the first proof-of-principle: a working prototype. In preparation of the next big step, a working prototype, we started further refining the design of the bike. This mostly means sketching 'til you can't no more, and then sketching some more. But again, this being a very time and budget limited project, we quickly transgressed to making quick and dirty 3D models to begin checking volumes and lines. We cannot show everything due to IP, but below is some material from this phase. 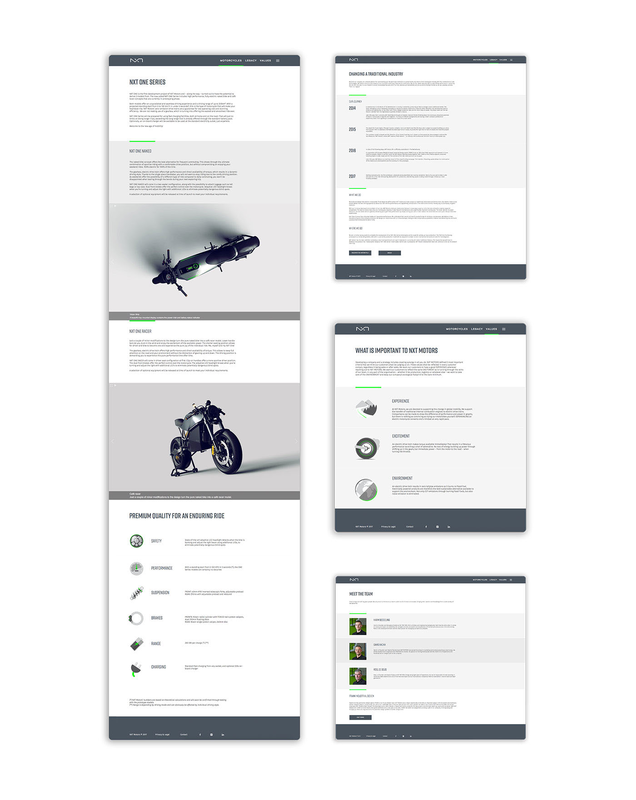 Tackling NXT Motors' website was a challenging one, as at this point in the project the main purpose of the site is to communicate a lot of written information. Looking for extra funding proved the need for background information, legacy stories and a focus on values. We opted to go for a no-nonsense, business oriented graphical style with a bespoke left aligned layout. Text boxes with slightly differing colours optically divide the pages in bite-sized chunks, with the NXT Motors green divider making the pages easier on the eyes.